Learning about Angel Island history give you a glimpse at how the United States treated its immigrants and why the island is so important to the San Francisco Bay area. Angel Island measures roughly 640 acres and is the largest island in San Francisco Bay. It was explored in August of 1775 by Spanish Naval Lieutenant Juan Manuel de Ayala, who was sailing the Spanish naval vessel "San Carlos" at the time. He was on a mission to map the bay and the area around it and to record descriptions of the area. Why Do They Call it Angel Island? Angel Island was named by Lieutenant Juan Manuel de Ayala. He called it "Isla de Los Angeles," which is Spanish for "Island of the Angels," because he arrived on the Catholic feast day of Our Lady of the Angels. The bay where he first landed is called Ayala Cove. 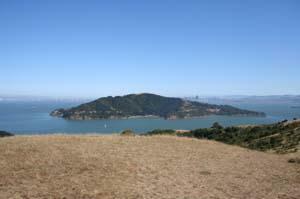 More than a thousand years ago, the Miwok Indians lived on Angel Island. It is believed that the Indians used it as a temporary hunting camp, traveling there in reed boats. In 1814, the British ship, H.M.S. Racoon arrived there leaking badly. Sailors tried to beach the ship in San Francisco, but instead, they beached it in Ayala Cove. The path the ship took between the bay and the cove is called Racoon Straits in memory of the event. The Spanish government granted the island to Don Antonio Maria Osio in 1839 with the condition that he could to build a fort there. He lived there until the Mexican War when he fled to Hawaii. When California became a state, the United States Navy claimed the Angel Island. In 1891, a quarantine station was built to house sick immigrants to prevent them from bringing diseases to San Francisco. It could house 1100 people by the first part of the 20th century, but it closed down in 1946. The 1800s saw a slew of immigrants arriving to California from China because of poverty and famine. There were plenty of jobs in California because of the Gold Rush and the building of the transcontinental railroad. Many American workers felt the Chinese were going to take their jobs away, and as economic conditions changed, discrimination toward the Chinese increased. The first thing that restricted immigration was a law passed in 1862 which barred any American ship from bringing Chinese immigrants to the United States. Twenty years later, in 1882, the Chinese Exclusion Act was passed. After that, the only way a Chinese person could immigrate to the United States was to have family already living in the country. In 1910, the Immigration Station at Angel Island was built. This was the saddest time in Angel Island history. For thirty years, from 1910 to 1940, the island was an immigration processing station. However, it was not like Ellis Island, where immigrants were processed in a matter of hours and sent on their way. At Ellis Island the immigrants were welcomed, but that was not the case at Angel Island. At Angel Island, Chinese immigrants were detained for months and even years. During those thirty years, around a million immigrants were processed. Most of them were Chinese, but some were Japanese, Filipino, Russian, Korean, and Mexican. The immigrants were interrogated to prove their eligibility to enter the United States and their life on Angel Island was akin to being in prison. It was very stressful and demoralizing for the new arrivals. Fortunately, laws restricting Chinese immigration were repealed in 1943. In 1955, the U.S. military took control of Angel Island and built a missile site there. After 1962, the missiles were obsolete, and the island was returned to the State of California to be used as a park. Today, Angel Island State Park is a very popular destination, and is visited by millions of tourists who arrive by boat or ferry. Angel Island history is interesting and varied. The Angel Island Immigration Station Foundation works to preserve its history, with emphasis on the Asians who immigrated there. The Angel Island Association also works to commemorate the past and leads tours of the island. Both organizations played a role in getting the Angel Island Immigration Station designated a National Historical Landmark.